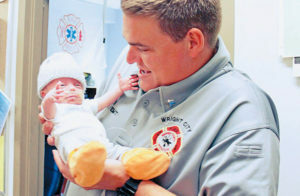 Firefighter Keith Terry held baby Greyson Schuster for the second time in his life in early August, not long after Greyson was released from two months in the hospital. The first time Terry held the baby boy, he said Greyson was smaller than his shoe. To be fair, Terry wears a size 13 shoe. But Greyson was tiny on the day he entered the world, 2 1/2 months ahead of schedule. He was 13 inches long and a little less than 3 pounds. Terry met Greyson was when he and a crew of Wright City firefighters helped mother Bethany Schuster deliver the baby on June 6, 2018. She was due to give birth August 21. Even though Greyson wasn’t quite ready for it, along he came anyway, catching Bethany by surprise at home with her family.